Sephora is coming to Fantasia Fair 2018. Sign up for your free class now! What to expect: A safe, inclusive environment with lots of hands-on learning! Late-breaking news! Have a safe trip to Provincetown! 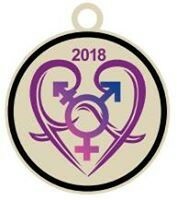 We have approved the artwork for the charm for 2018. Cleverly and skillfully designed by Dee LaValle, the pin incorporates and seamlessly blends the Fantasia Fair logo, with its two reversed styllized Fs, with the transgender symbol developed in the 1990s by the late Holly Boswell. The charm, like the ones from previous years, is 3/4″ and made of metal. It comes with a loop for attaching to a bracelet or necklace, but can be easily converted to a lapel pin by use of a stick-on back. These will be available in the Fair office. Just ask us for one. Hooray, the August FF Newsletter has been published! Short Biographies of Presenters and Fair personnel will soon be up. Presenters of workshops and leaders of activities can be viewed on the Schedule of Events. Be sure to check this page and the Schedule of Events page regularly. Massachusetts is bracing for an anti-trans accommodations ballot initiative in November. 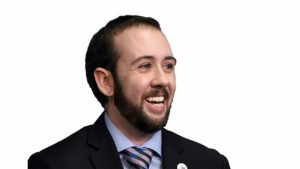 Mason Dunn, Executive Director of Massachusetts Transgender Political Coalition and co-chair of Freedom Massachusetts Coalition, will be speaking about the initiate in a keynote at Fantasia Fair on Friday, October 19 from 1:30 – 2:45 pm. His talk will be in the Cabaret Room at the Crown & Anchor, 247 Commercial Street, and is open to the public at no charge.